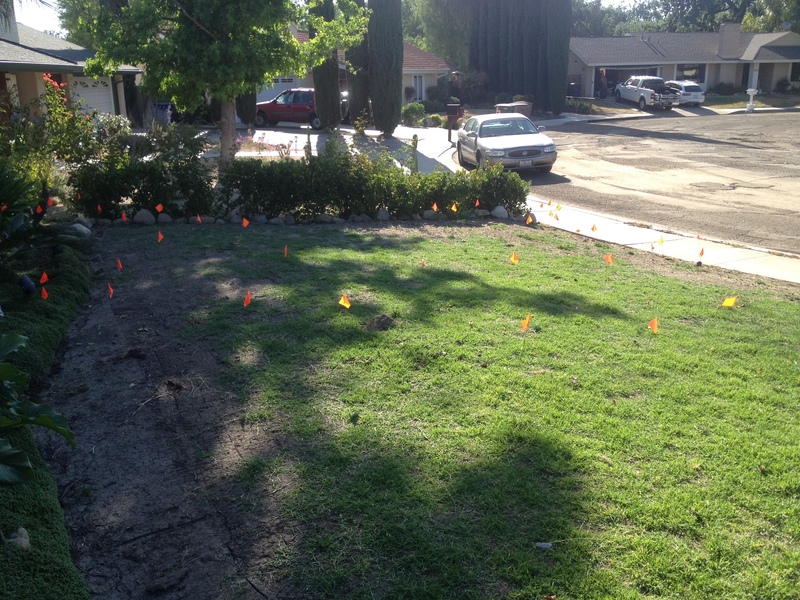 ⇓ BEFORE Front Yard: Well maintained grass has gotta go! 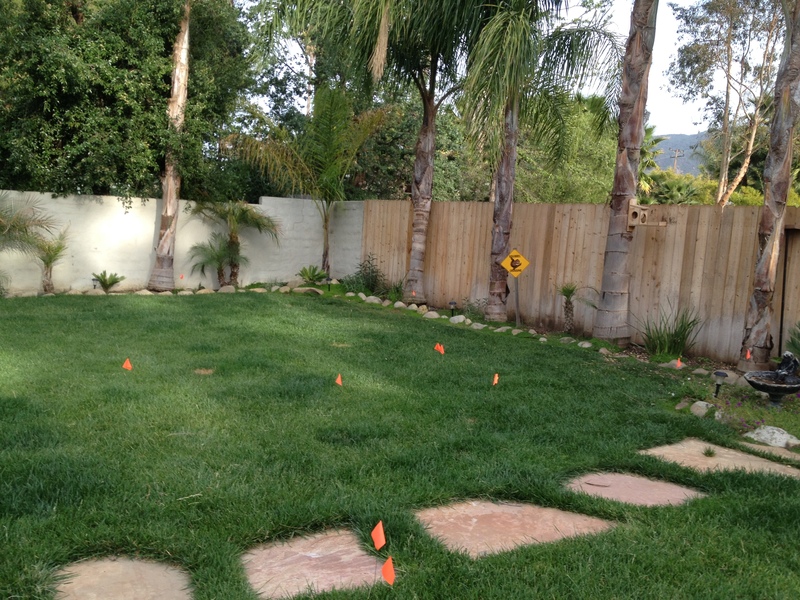 ⇓ BEFORE: Back Yard, well maintained grass has gotta go . 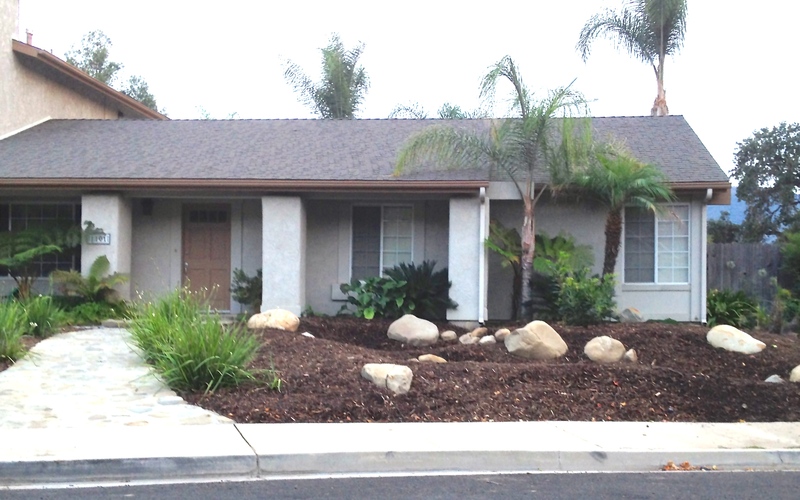 . .
⇓AFTER: Front yard turf removed, sheet mulched, sculpted to capture rain water. 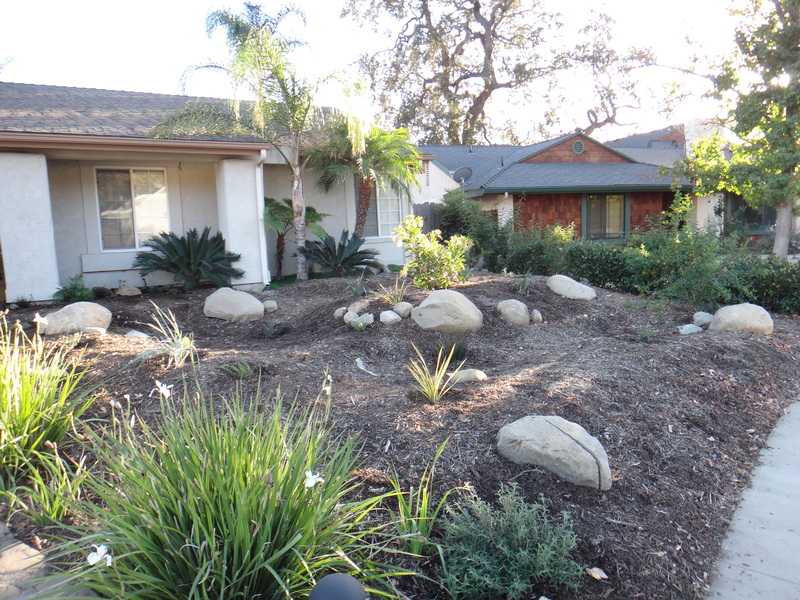 This front yard will capture 860 gallons of water in 1″ of rain! Plants are now in—we are ready for rain! ⇓ and it finally rained! I led hands-on-workshop on how to plant, what to plant, with berms and swales that capture rainwater off the roof, along with converting pop-up irrigation to drip. 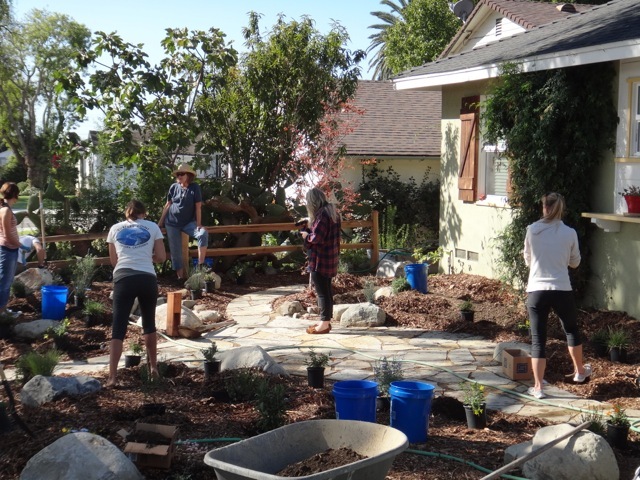 Surfrider Ocean Friendly Garden team had removed turf and created rain water catchment areas. Thank you Tyrone, Ashley and Wayne for coordinating the design and layout! Standing Room Only at the FREE Graywater Water Wise Class. Left to Right: Guest Speakers Renee Roth (http://rainscapedesigns.com/), Laura Maher, Ventura Mayor Cheryl Heitmann, and Environmental Specialist Jill Santos. — with Laura Maher at Sanjon Maintenance Yard Administration. Before – Grass has got to go, with large roof area to capture rainwater! 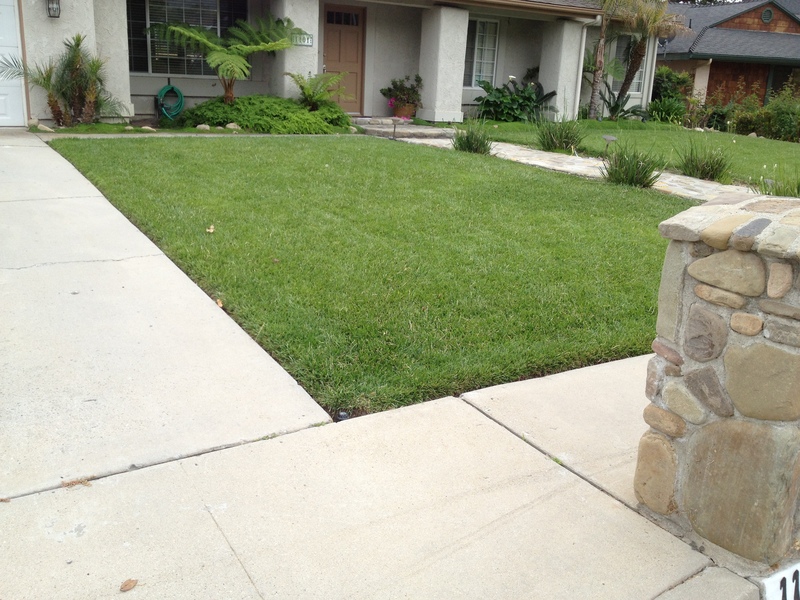 Turf removed with Sod cutter, posted free sod on Craigs list and people came to haul it off! AFTER: Planting Day! The plants have been delivered, and chunks of concrete from a driveway down the street are delivered to create urbanite patio and pathway. Don’t forget the soil — years of compacted turf left the soil depleted of life—we need to help the plants get established and build soil that could hold water, air and microorganisms. August 2015 , most of the plants survived the HOT Ojai summer, but we still have September and October which can also be very hot and dry. 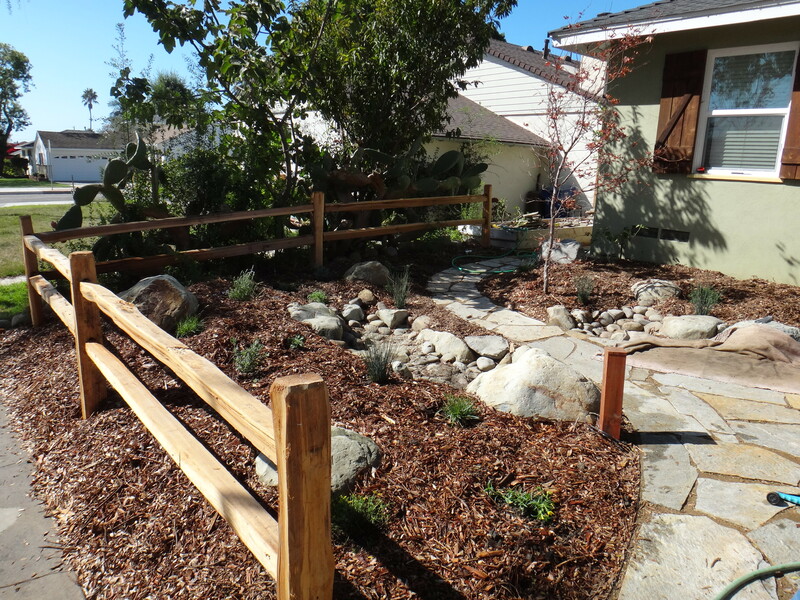 Pathways, patio and benches create a place to enjoy being in this “natural” yard. 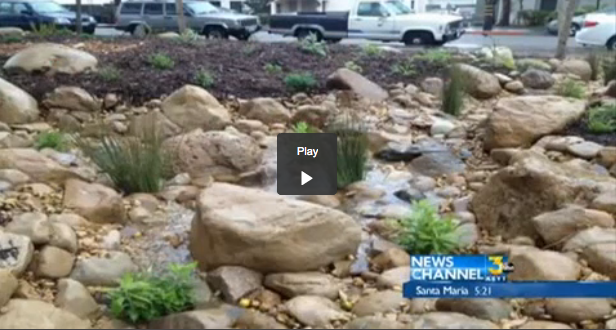 SANTA BARBARA, Calif. – Santa Barbara City College Center for Lifelong Learning finished its landscape transformation project to help reduce water use and was successful. College staff say the new garden and landscape did quite well capturing water from the recent storms. They collected 7,000 gallons of water from roof runoff which is roughly 1,000 gallons per inch. The water is then stored in the ground which will help with the irrigation for the plants, which in return conserves water. “There will be some supplemental irrigation needed, but mainly that’s just to insure the plants are really established and thriving throughout the summer,” said Ground Maintenance Supervisor Mark Broomfield.